A strong economy, tightening labor market and an expected stimulus package from President-elect Donald Trump would seem to be a recipe for higher inflation and tightening by the Federal Reserve. 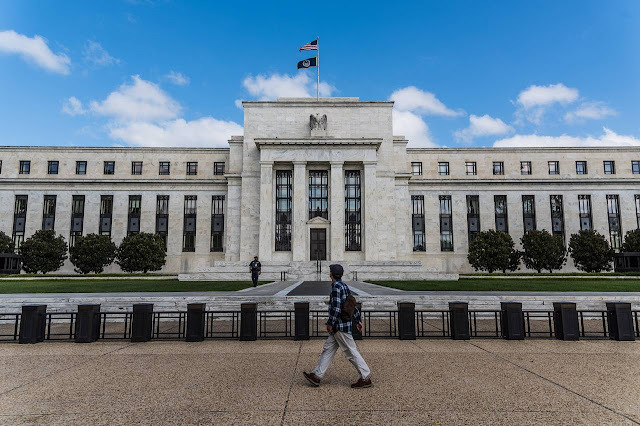 But a close look at gross-domestic-product data released Tuesday shows why inflation may not jump and why the Fed, while likely to raise rates next month, could remain cautious. The reason lies in corporate profits, profit margins and the share of income going to labor. Revisions from the Commerce Department on Tuesday showed that gross domestic product grew at a 3.2% annual rate in the third quarter, better than the preliminary estimate of 2.9%. The updated figure might be low. Gross domestic income—a measure that in theory should be the same as GDP, and that research has shown tends to be a more accurate reflection of the economy—grew by 5.2%. Corporate profits were also strong, benefiting not just from a growing economy, but a pickup in companies’ slice of it. Domestic profits after taxes, but not adjusted for inflation, rose 9.9% from the second quarter. As a result, profit’s share of GDI—an economywide measure of profit margins—increased to 6.2% from 5.7%. That isn’t as high as the 7.3% registered in the fourth quarter of 2011, but it is well above the average share of 5% over the half-century that preceded the last recession. A big reason that margins have been so strong in recent years is that less income has been flowing to workers. Employee compensation came to 53.6% of GDI in the third quarter. It has been rising steadily from its low of 52.2% logged in the third quarter of 2014, but is well off the average of 56% over the 50 years preceding the recession. For the Fed, labor’s diminished share of the economy may count as an argument not to jump the gun on rate increases. How much workers are paid isn't part of the Fed’s remit, but their situation might help limit inflation. That is because companies faced with a tight job market might have to raise wages at a faster pace to attract workers. But since working households haven’t seen income gains since the 1990s, the companies may struggle to make price increases stick. That could keep inflation below the 2% rate the Fed is aiming for. The impact of higher wages would be felt in profit margins, which could decline toward their long-term average. But if the economy, and therefore sales, are growing at a faster clip, that is a pill that companies, and their shareholders, might find easy to swallow. Will Trump’s Plan Really Boost US Demand? CAMBRIDGE – Ever since Donald Trump won the US presidential election, the press and financial markets have focused on his proposal to cut taxes and to spend $1 trillion on infrastructure over the next decade. The expectation that these policies will increase aggregate demand has pushed up long-term interest rates by 50 basis points. But the assumption that Trump’s policies will lead to higher prices and wages doesn’t square with the details of his proposals. Anyone who listened to his speeches or read his campaign material should have noted that he was not proposing that the federal government should carry out the infrastructure investment. He was not calling for a Keynesian fiscal stimulus based on deficit spending. Instead, Trump’s campaign called for a “deficit-neutral system of infrastructure tax credits” to provide incentives for private businesses to undertake projects to build roads, bridges, tunnels, airports, and so forth. Of course, it is not clear that Congress will agree to such large new tax credits. And even if it does go along, there is no guarantee that businesses will respond as intended. Traditional investment tax credits have been used successfully in the past to encourage businesses to expand their capacity to produce the products they make and sell. But how will businesses earn any revenue from owning roads, bridges, and tunnels? And even when there are revenues to be earned, as there could be from airports, businesses might be deterred by the need to rely on long-term pricing agreements. It is also easy to fall into the trap of thinking of the tax cuts as a way to boost aggregate demand. But congressional Republicans may insist on paying for the cuts in personal income tax by limiting the deductions that individuals now use to lower their tax bills. The tax plan put forward on behalf of the Republicans by Paul Ryan, the speaker of the House of Representatives, calls for eliminating all deductions other than those for charitable contributions and mortgage interest. That change would raise revenue equal to about 1% of GDP, enough to pay for very substantial reductions in individual tax rates. Ronald Reagan’s famous Tax Reform Act of 1986 was a supply-side policy designed to improve incentives, rather than a traditional demand-side policy designed to put more cash in people’s pockets. The Reagan tax plan used changes in deductions and other accounting rules to pay for major cuts in tax rates that lowered the top rate from 50% to 28%. The lower marginal tax rates induced individuals to work more and to receive more of their potential income in taxable cash rather than in fringe benefits and other forms of compensation that are not subject to tax. If individuals had not responded to the changed incentives, the Reagan tax cut would have been revenue-neutral. But, because taxpayers did respond to the improved incentives, real pre-tax incomes rose and tax collection actually increased. The Republican Congress would do well to model the Trump tax cuts on Reagan’s supply-side policies. In the 30 years since the Reagan tax cuts were enacted, tax rates have increased substantially, particularly for higher-income taxpayers. The top rate has increased from 28% to 39.6% on wages and salaries, and to more than 43% on some forms of investment income. According to the Congressional Budget Office, the effective tax rate fell for most income groups in the 30 years from 1984 to 2013, but it rose substantially for the top 1%. More specifically, for households in the lowest quintile, the effective tax rate in 2013 was 3.3%, about half of what it had been on average over the previous 30 years. Among the middle three quintiles, the effective rate in 2013 was 13.8%, down from an average of 16.6% over the three previous decades. For the next 19% of taxpayers, the effective tax rate fell only slightly. But for the top 1%, the effective tax rate rose 3.4 percentage points, to 34%. Against this background of rising tax rates and a shift in the tax burden to those with the highest income levels, it would not be surprising if Congress reduced the top tax rates and broadened the tax base in a revenue-neutral way. There is of course no reason to seek an increase in aggregate demand at this time. The economy has essentially reached full employment, with the unemployment rate at 4.9% in October. The tight labor market caused the core consumer price index (which excludes food and energy) to rise 2.2% over the past year, up from 1.9% a year earlier. And production workers’ wages rose 2.4%, faster than prices. The Federal Reserve can begin the process of raising interest rates in December without any need for an offsetting fiscal boost to demand. The euro has survived sovereign default, recessions, banking crises and bailouts. It may not survive populism. In the coming year, the eurozone will host at least five elections or referendums that could bring a populist, euroskeptic party to power. In effect, the common currency is about to play multiple rounds of Russian roulette. The populist threat is qualitatively different from the financial crisis that first erupted in Greece in 2009 and eventually engulfed half the region. In that case, what worried private investors was that a country, or its banks, would default on its debt and be forced to leave the euro. Investors fled, driving interest rates sky-high and plunging the continent into recession. The European Central Bank ended that panic by effectively promising not to let any country be forced out of the euro. By contrast, the threat today is that a country will choose to leave the euro. 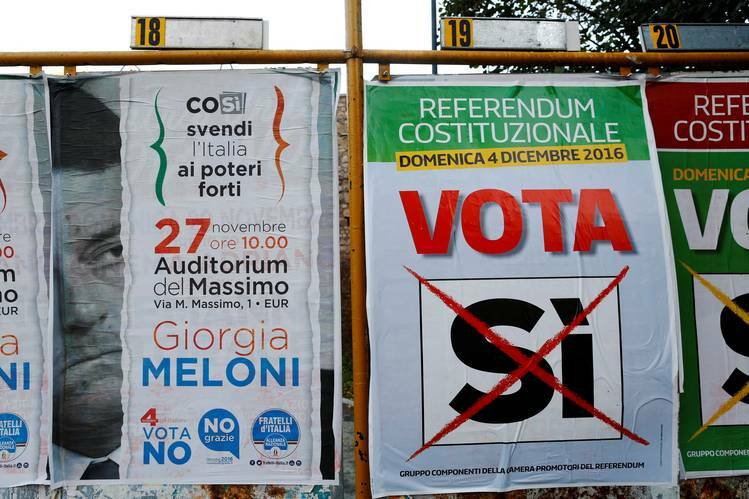 The first test comes Sunday, when Italians vote on a new constitution and Austrians elect a new president. Depending on the results, that could pave the way for new elections that eventually bring either the antiestablishment 5 Star Movement to power in Italy or the far-right Freedom Party in Austria. Next year, France, Germany and the Netherlands all hold national elections. The biggest risk is that Marine Le Pen, leader of the anti-euro National Front, is elected president in France. Mrs. Le Pen isn’t expected to prevail in the second round against the Republican candidate François Fillon, and even if she did, her party wouldn’t control Parliament. Indeed, few of Western Europe’s populist parties are strong enough to form a government by themselves. But momentum is moving in their favor. To be sure, Britons voted to leave the European Union and Americans elected Donald Trump president for reasons that may not resonate on the continent. Yet the fact that British and American voters defied the establishment and didn’t pay the predicted economic price reduces the stigma for Europeans inclined to cast an antiestablishment vote. Moreover, the establishment is losing an important ally: Barack Obama is a vocal supporter of the European Union and euro. Mr. Trump and Europe’s anti-euro parties, by contrast, are fellow travelers. The euro’s durability shouldn’t be underestimated. Despite the misery the euro has brought, polls show solid majorities in every major member country want to keep it. In fact, the euro is much more popular than the populists who would scrap it. Alternative for Germany began as an anti-euro party but languished in the polls until an influx of Middle Eastern refugees elevated its anti-immigration appeal. Knowing this, populists may soften their opposition to the common currency as they get closer to power. 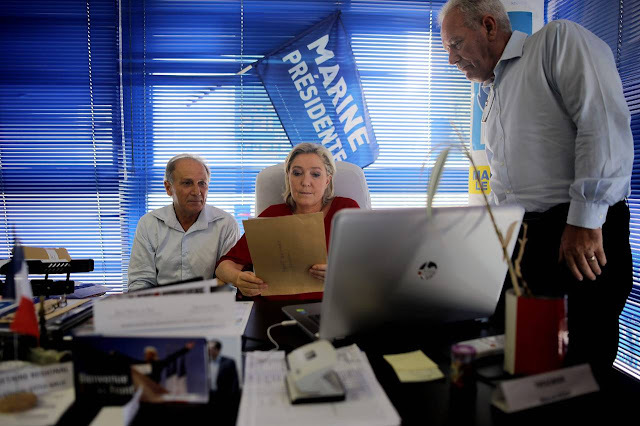 The National Front, for example, may water down its euroskepticism when it releases its 2017 platform. Yet even if the populists never take control of a legislature, their expanding presence threatens the common currency’s future. If Mrs. Le Pen closes in on the presidency next spring, investors may flee French debt for fear it will be redenominated into francs. At that point, the ECB’s options are limited. It currently buys about €14 billion of French debt a month as part of a broader bond-buying program to stimulate growth. That’s slightly less than what France must borrow to finance its deficit and refinance maturing debt. The ECB could tilt more of its bond-buying toward France, but it can’t buy enough to absorb a broad-based selloff. The ECB and the European Stability Mechanism, the region’s bailout fund, can explicitly support French debt only if France agrees to policy changes dictated by the European Commission. “Of course, Le Pen will never do that,” says Mujtaba Rahman of the political risk consultancy Eurasia Group. Thus, the ever-present risk of a populist government could unsettle markets and undercut still-fragile recoveries. 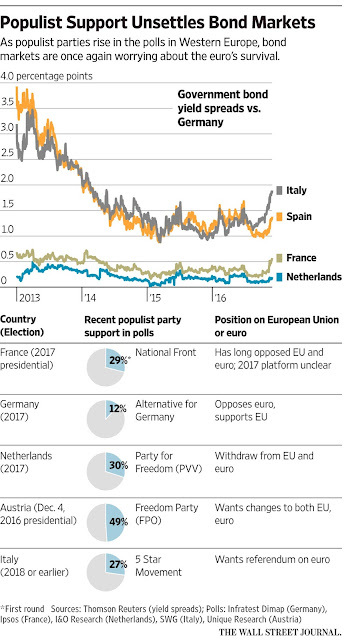 Establishment parties, threatened by the euroskeptic right, will in turn be reluctant to agree to the changes necessary to address the euro’s structural flaws, such as a larger common budget, deposit insurance or debt guarantees. The euro may yet survive the coming year; the coming decade looks much less promising. •25 years on, Minsky’s instability hypothesis is worth a fresh look. •Global monetary authorities have, unwittingly, become agents of instability. •Expect an inflationary outcome, but don’t presume the object of inflation. •Trend-following strategies work well in periods of accentuated boom and bust. Like everyone else, I studied the "Efficient Market Hypothesis" in B-school. As time rolls on, however, the notion of market equilibrium is less appealing than theories of disequilibrium proposed by George Soros, Charles Kindleberger, Dean LeBaron, and others. “ The first theorem of the financial instability hypothesis is that the economy has financing regimes under which it is stable, and financing regimes in which it is unstable. The second theorem of the financial instability hypothesis is that over periods of prolonged prosperity, the economy transits from financial relations that make for a stable system to financial relations that make for an unstable system. In particular, over a protracted period of good times, capitalist economies tend to move from a financial structure dominated by hedge finance units to a structure in which there is large weight to units engaged in speculative and Ponzi finance. Furthermore, if an economy with a sizeable body of speculative financial units is in an inflationary state, and the authorities attempt to exorcise inflation by monetary constraint, then speculative units will become Ponzi units and the net worth of previously Ponzi units will quickly evaporate. Consequently, units with cash flow shortfalls will be forced to try to make position by selling out position. This is likely to lead to a collapse of asset values. The financial instability hypothesis is a model of a capitalist economy which does not rely upon exogenous shocks to generate business cycles of varying severity. The hypothesis holds that business cycles of history are compounded out of (1) the internal dynamics of capitalist economies, and (2) the system of interventions and regulations that are designed to keep the economy operating within reasonable bounds. Paragraph three conveys a most important point - perhaps even a profound statement. The market economy is driven more by internal dynamics than by exogenous shocks. As leverage increases, the financial system assumes a life of its own, influencing economic decisions and exaggerating the business cycle in both directions. Financial causality, in other words, is mainly endogenous. The system is prone to self-feeding processes, which can run to extreme states of disequilibrium until eventually corrected by a crash or upheaval. Compare this model of reality to mainstream thinking embraced by modern economists, including Janet Yellen, Mario Draghi and Haruhiko Kuroda. (Let's reserve judgement on China's Zhou Xiaochuan for now.) To these thinkers, the market economy maintains equilibrium until altered by an exogenous shock. This explains the Fed's obsession with "incoming data." It also explains the Fed's desire to build a cushion in the Fed funds rate in order to respond to the next downturn. “Our ability to predict how the federal funds rate will evolve over time is quite limited because monetary policy will need to respond to whatever disturbances may buffet the economy…. The reason for the wide range [of forecasts] is that the economy is frequently buffeted by shocks and thus rarely evolves as predicted. When shocks occur and the economic outlook changes, monetary policy needs to adjust. This is not to say that central bankers are ignorant of Minsky. They occasionally warn about excessive debt, and possible distortions from monetary policy. By and large, however, they don't acknowledge their own role in the Minsky process. The Fed's mission is to promote stability. It sees itself as a white knight, battling external shocks; not an agent of instability. 1. The Fed has become an agent of instability. It is attempting to bootstrap the economy by "priming the pump." This tactic is useful in arresting financial panics, but not as an ongoing policy. 2. Don't expect the Fed to implement an exit strategy. The Fed cannot normalize because it has embraced the wealth effect, which also works in reverse. The Fed may tighten, but it will not tighten enough. 3. Central banks around the world have committed to doing "whatever it takes," which is itself a moving target. Global monetary authorities are all playing the same game: competitive devaluation. But there is no free lunch. The world cannot export to itself, so the likely outcome is inflation. 4. Expect an inflationary outcome, but don't presume the object of inflation. Inflation is a policy, not an exogenous force. 5. The object of inflation is decided by the market, not by central bankers. The object of inflation might be consumer prices… but it might also be stocks, commodities, gold, real estate, or even bonds. Don't impose a rigid view on the market. Let the market tell you where inflation is headed. 7. Trend-following strategies work well in periods of accentuated boom and bust. Remember the old saying: "Speculative markets rise to unimaginable heights, then they double." Markets in extreme disequilibrium, however, are likely to collapse once the leveraging process reaches a tipping point. Watch for signs of long-term exhaustion... and be sure to respect the major trend in both directions. In a Minsky world, investors should expect dazzling bull markets and spectacular routs. The Dow might easily reach 30k… on its way to 10k, for example. Valuation is important, but may be useless over long stretches of time. While the market is ultimately a "weighing machine," it is also a "voting machine," heavily influenced by internal dynamics. Bizarre outcomes, such as negative interest rates, soaring P/E ratios, and market separation from the real economy, all make sense in Minsky terms. Tired of the efficient market hypothesis? Try disequilibrium for a change, and see what a difference a presumption can make. Hyman Minsky had it mostly right, and the modern Fed has it mostly wrong. Central bankers are now trapped in an unstable, self-feeding reality of their own making. For my money, this simple proposition is the key to financial markets for the next decade or longer. But don't look for disequilibrium everywhere at all times. Though central bankers are the culprit du jour, the theory should apply with or without their complicity. Booms and busts have always existed. Human beings are the ultimate source of instability.